When evaluating a trading chart, everything you really need to know about security price momentum is that it compares the price today with the price x periods ago. A higher number means a faster speed — and momentum is all about speed. The subtraction method gives you a simple way to determine momentum. The number 5 means that the price has risen by $5. As a single number, this momentum reading isn’t useful, but put it together with the momentum output from every day, and now you have a working indicator. 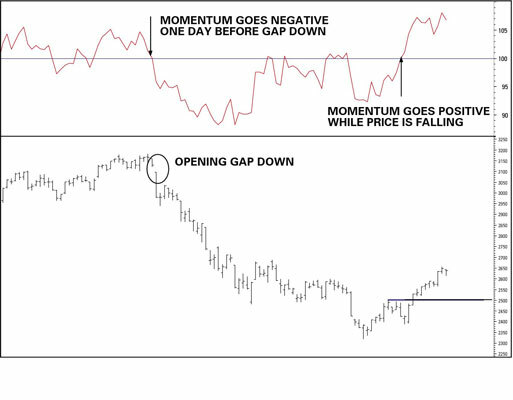 In this figure, the momentum indicator crosses into negative territory (meaning that the latest price is lower than the price five days before) one day before the price opens gap down. A little later, the momentum indicator reaches the positive-negative line but fails to hold it for longer than a day. Finally, momentum crosses above the line while the price is still falling. But sure enough, momentum accurately forecasted a price rise. Three days later, the price matches a previous high and breaks out to the upside. On Day 6, the momentum indicator starts going sideways. The price still rose $1 on Day 6, but momentum didn’t change. The price is still rising, but the momentum value didn’t change.